Fed-up with dark circles and wrinkles under your eyes from long hours out on the ranch? This product is for you! Cowgirl Dirt’s Under Eye Highlighting Concealer neutralizes dark areas under your eyes while adding definition and life to them through its highlighting capabilities. Our unique formula is light and airy so there is no need to weigh down your eyes with regular concealer to cover up dark circles. This concealer containers anti-aging ingredients that nourish your skin while you wear it. Other ingredients moisturize your skin, rejuvenate your cells, and protect you from the sun. 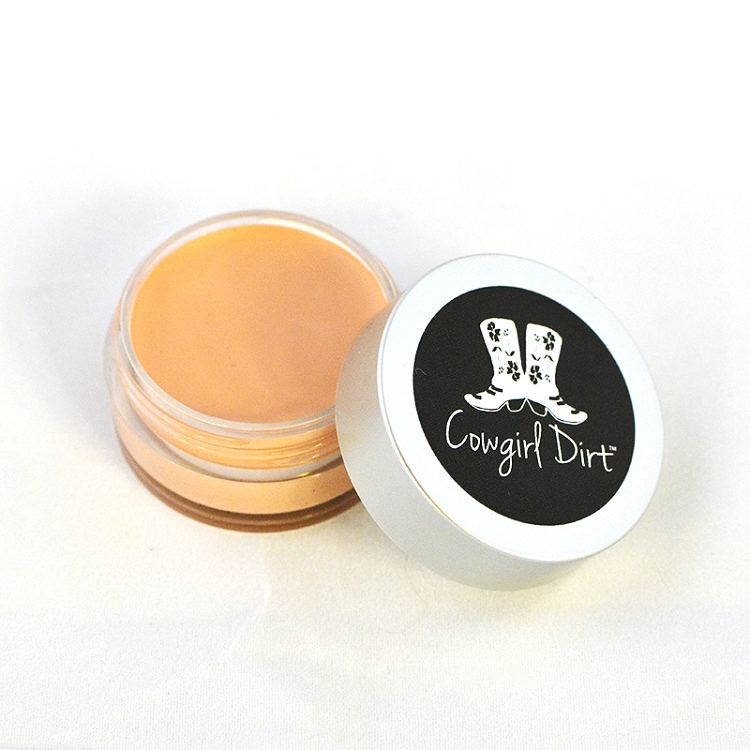 Brighten up your eyes with Cowgirl Dirt’s Under Eye Highlighting Concealer. 1gram Sample Size good for 1-3 uses. I was very pleased with this product. It is probably the best highlighter I have used and I am a former "pink lady" consultant. So, I am very picky about my products. Wow, this stuff is amazing! I totally thought this would be an okay product and then I put it on and WOWSER! It really works. My dark circles under my eyes disappeared! I know they didn't really disappear, that the light is reflecting differently, but what a difference. I will be buying a full size version of this. I love this under-eye concealer. It goes on so smooth and creamy and blends into my skin perfectly. It balances out the tone under my eyes which normally has darkness there. It's not cakey or chalky or oily -- it's just perfect! I ordered a sample of this and definitely want to order the normal size. This is wonderful. My dark circles are much less noticeable. This concealer feels light and doesn't cake in the creases under my eyes. It provides just enough coverage to naturally cover any pimples or under eye darkness without looking like I have a bunch of product hiding my flaws. I will be ordering the full size. Ive never really used an under eye concealer before so I thought i'd give this one a try and I LOVED IT! Will definitely be ordering more in the very near future! This is a VERY greasy concealer and WILL sit in the creases under your eyes!! It does brighten up under your eyes but is very greasy but creases SOOOO BAD!! I ordered a sample of the under eye highlight concealer and I really liked how smooth it was and covered so well. I would purchase this again. At first sight I thought it was going to be to orange for my skin tone. But it matched and seems to hide my imperfections! The unique blend of ingredients in Cowgirl Dirt’s Under Eye Highlighting Concealer brings your skin more than just the benefit of hiding dark circles. Certified Organic Argan Oil: This oil is full of fatty acids that help protect your skin from pollution and sun exposure. Certified Organic Beeswax: This organic hydrating ingredient helps to increase your skin’s moisture. Certified Organic Neem Extract: This antibacterial and antiseptic gives your face even more moisturizing and soothing benefits. Certified Organic Raspberry Fruit Extract: This antioxidant supplies your skin with Vitamin C and bioflavonoids all while fighting off free radicals. Certified Organic Rosehip Fruit Extract: This antioxidant extract is packed full of benefits for your skin. It not only reduces inflammation and irritation but it also assists in skin cell regeneration. Silica: Completes your look by providing your skin with a soft natural look by reducing the appearance of large pores, fine lines, and wrinkles. Certified Organic Non-GMO Caprylic/Capric Triglycerides (coconut oil extract), Zinc Oxide, Certified Organic Cera Alba (Beeswax), Certified Organic Simmondsia Chinensis (Jojoba) Seed Oil, Silica, Non-GMO Radish Root Ferment Filtrate, Certified Organic Argania Spinosa (Argan) Oil , Certified Organic Rosa Canina (Rosehip) Fruit Oil, Certified Organic Neem (Melia Azadirachta) Seed Oil, Natural Clay, Certified Organic Camellia Sinensis (Green Tea) Leaf Extract, Certified Organic Passiflora Incarnata Flower (Passion flower) Extract, Certified Organic Rubus Idaeus (Raspberry) Fruit Extract, Non-GMO Natural Vitamin E Oil (+/- Iron Oxides, Org Essential Oil Blend). The Under Eye Highlighting Concealer’s rich, airy texture makes application a breeze. Not only is it easy to apply, you barely feel the concealer once it’s on, giving your eyes a break from being worn down by thick concealers. 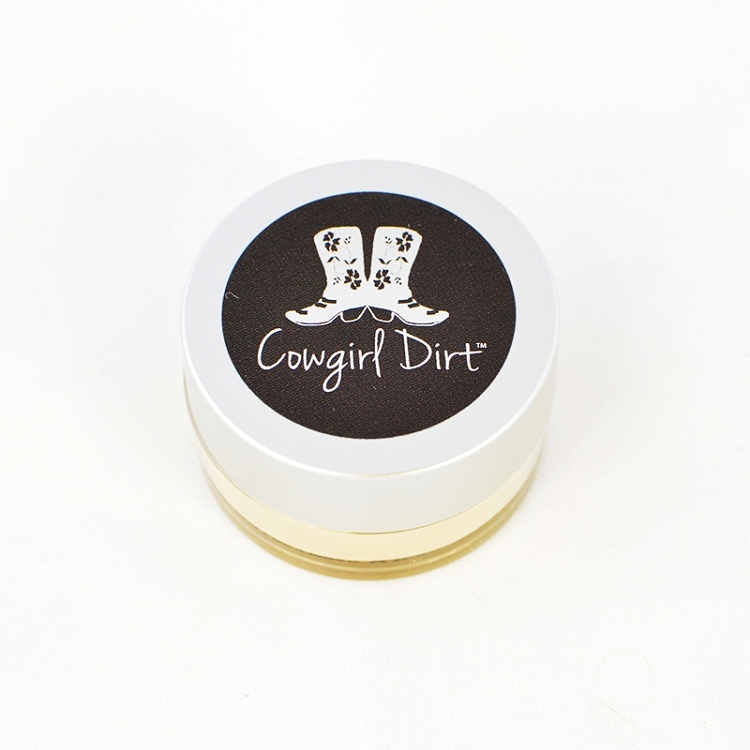 Take Cowgirl Dirt’s Concealer Brush and apply a small amount of the concealer to the brush. Start by applying from the inside corner of your eye to the outside underneath. Continue to apply in a triangular fashion down to your cheek bone, or to where the hollows of your eyes end. This will provide the greatest highlighting benefit to your eyes. To finish, lightly dust Cowgirl Dirt’s Finishing Powder, Foundation, or Silk Veil over the area to set and smooth your look. Q: Why does the under Eye Highlight Concealer only come in one shade? A: The pink coloring absorbs right into your skin, taking all the guess work out of picking the correct shade. The natural color highlights and brings life to your eyes.